Constantly working like a crazy person, but you just get that feeling gnawing away in the back of your mind, “I just never seem to be making progress”. You’ve probably heard that saying before that, doing the same thing every day, and expecting a different result, is the definition of insanity. Unfortunately, I see this happening a lot. 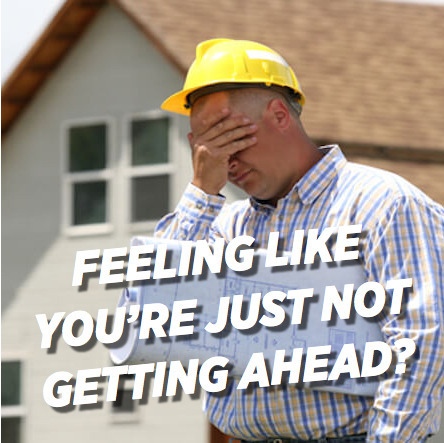 Builders keep doing the same thing day after day, week after week, in the way they quote, in the way they manage their team, in the way they deal with customers, and the same frustrations keep popping up. Since we started builders business blackbelt, and focusing on supporting custom homebuilders, we have learned a lot and refined our approach to fixing these problems. The biggest step forward has been in the simplification of looking at a building business. We’ve broken the building business down to just four areas. One: attract – this is the blackbelt version of marketing. Two: qualify – this is the blackbelt version of selling. Three: deliver plus – this is the blackbelt version of the build process. Four: scale – this is all about scaling your thinking and improving your effectiveness as well as your money management and measurement. So how does this help you. Well…we have found the simplest way to start to improve things is look at each of these areas separately, and ask questions to figure out which one area to work on at the moment, rather than all of them, all of the time. So to figure out which area you need to work on give yourself a number from 1 to 10 (10 being the best, one being the worst)… (Attract) Do you have enough quality leads? (Qualify) Are you converting enough of those leads into customers? (Deliver+) Are you getting all of the work done in a timely manner? (Scale) Do you feel good about your business and are you making enough money? I suggest the rating that is the lowest, is the area that you need to go to work on as a priority. Get it to a point where you are happier, then re-ask these questions, and then change focus.